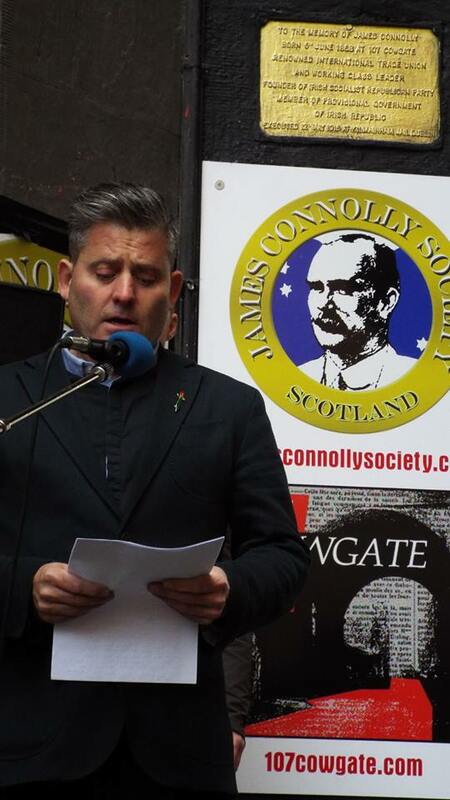 The main speech at the 2015 James Connolly Commemoration in Edinburgh was delivered by Pól O’Scanaill, National Organiser of the 1916 Societies. Video of the speech, followed by some photographs from the commemoration can be viewed here. It is a great honour for me to be asked to speak at this commemoration for one of my great hero’s James Connolly, especially here at this historic building. I want to thank the James Connolly society for this honour, I also want to commend the great work that the society does in the community here in Edinburgh. I also want to commend and thank you all, because I do not think that you have received the recognition and appreciation for the steadfast support that you have given for the cause of Irish freedom down through the years from the time your ancestors were forced off the land. When we had very few friends around the world you the Irish in Scotland always supported us. Go raibh mile mile maith agaibh leis ar Eireannaigh in alba. Next Saturday the 1916 societies launch our ONE IRELAND, ONE VOTE Campaign, we believe that like Scotland the people of all Ireland should determine the future of the island. The 1916 societies are an Irish Independence / separatist movement, we believe that the Irish Republic should be an Independent state as envisaged in the 1916 Proclamation. We believe that the Irish Nation is sovereign and that the people of Ireland alone have the right to determine the future of the island free from external impediment. We believe that National self-determination in the form of an all-Ireland referendum on Irish unity will give every Irishman and women an equal say on partition and speed the formation of an independent state to replace the 2 failed states and its 2 failed political institutions in Stormont and Leinster house, both of which are still under the control of the English crown. We in the 1916 societies believe that the proposed border poll under the terms of the Good Friday Agreement conflicts with the principle of self-determination and the democratic rights of the Irish people. it is in effect nothing more than a sectarian head count designed to uphold the unionist veto and maintain the status quo in the 6 counties. It is very clear that Britain continues to refuse to recognise Ireland as one democratic unit, this is enshrined in the Belfast agreement. New proof of this has emerged recently in the form of video footage of former British prime minister Tony Blair dismissing out of hand the call for an all-Ireland referendum during the Good Friday Agreement negotiations. This was accepted by our former comrades in new Sinn Fein and their fallback position is this border poll, even as recent as last week Martin McGuiness called for the undemocratic border poll to take place. He also declared his fondness and admiration for the English queen. McGuiness knows that this poll will fail and when it does the prospect of another poll would not even be considered for at least another 7 years. Like the treaty negotiations of 1921 deceitful British politicians and civil servants out manoeuvred, hoodwinked or simply bought off the Irish representatives. It is with great sadness that i have to tell you that our former comrades now enthusiastically implement british rule and neoliberal conservative party austerity on our people in the north. The good Friday agreement copper fastens partition and cements british rule in Ireland. It further adds to the democratic deficit on the island of Ireland. Schedule 1 of the agreement gives the british secretary of state a supreme veto over Irish self-determination and guarantees the continued gerrymandering of the island for the purposes of the british government. The terms award Britian through their secretary of state exclusive rights to determine. If and when a border poll may be called. The sole authority to decide the wording of such a poll. To decide who will be allowed to vote and who will NOT be allowed to vote in the poll. Even in the unlikely event that that the poll was not to the satisfaction of the british the result is not legally binding and would be subject to the assent of the British parliament in Westminster. This ‘Triple Lock ‘ effectively bars any movement towards ending partition, ensuring that Irish unity remains no more than an aspiration with little prospect of it being actually realised. We believe that genuine self-determination can only be realised in the form of an all-Ireland referendum our ‘ One Ireland One Vote ‘ campaign. Through such a democratic process we intend to empower the Irish people to secure their sovereign destiny, a 32 county Irish Republic founded on principles of the 1916 proclamation. A Republic worthy of the name and worthy of the sacrifices made by generations of Irishmen and women. We respectfully request from you ‘ our exiled children in Scotland ‘ your endorsement and support for our ‘ One Ireland One Vote ‘ campaign. We in the 1916 societies watched with great interest and anticipation the Scottish referendum for Independence, we were sure that the people of Scotland were going to BREAK THE UNION. We learned many lessons from your campaign . Unfortunately the scare tactics , the lies and the false promises won the day, but I believe the dark forces that defeated Scottish independence have only postponed the inevitable. “If you remove the English Army tomorrow and hoist the green flag over Dublin Castle., unless you set about the organization of the Socialist Republic your efforts will be in vain. England will still rule you. She would rule you through her capitalists, through her landlords, through her financiers, through the whole array of commercial and individualist institutions she has planted in this country and watered with the tears of our mothers and the blood of our martyrs”. Those words were written by James Connolly over 100 years ago, I believe these words are just as relevant today in 2015. For the last 8 years Ireland has suffered from the effects of recession caused by the financial crash that started in this city with the collapse of one bank on Wall street. With the collusion of traitors in Fianna Fail , Fine Gael and Labour the Irish people were forced to bail out the European banking system. The Irish people consist of 0.5% of the population of Europe yet we were bullied into paying 42% of the total cost of the financial crash and to bail out failed banks, an odious debt was foisted onto the shoulders of future generations, a debt that is not ours . Each Irishman, women and child has had almost €9000 of debt placed on their shoulders as opposed to the European average of € 192 to pay for the European banking crisis. This has caused devastation to the living standards of our people, the most vulnerable in society have suffered the most with cuts to vital services. This week a 101 year old woman spent 26 hours on a trolly in Tallagh hospital, a women born in 1913 the year of the lock-out, this is how our old people are treated due to austerity. This has also caused a massive rise in suicides due to the pressure placed on people by financial institutions. These corrupt banks which were bailed out by the Irish people are now evicting families from their homes, Ireland is under attack our natural resources, our oil ,our gas, our forests, our fisheries our water are being sold off to corporate entities, Billions of Dollars of Gas from the Corrib gas field off the west coast have been signed away by corrupt politicians with no benefit for our people. The green flag may well fly over Dublin castle but who really rules Ireland ? , Is it the capitalists and financiers who brought Ireland to its knees? Is it the capitalists and financers of the EU/IMF who forced gombeen governments to sacrifice the future of our children and grandchildren by bailing out the European banking system. Is it the commercial and individualist institutions that Connolly spoke about ? Individuals like Dennis O’Brien? ( the modern equivalent of William Martin Murphy ) A blueshirt tax exile who owns half the country and pays no taxes in Ireland. The good news is that the Irish people have started to fight back, after 8 years of savage austerity the people have found their backbone, the final straw came when the blueshirt government granted the contract to install water meters in every home to tax exile Denis O Brien. They plan to privatise our water supply at the behest of the Troika, this was the final straw for most people. The plan to charge us for water when we already pay for it through general taxation was the spark that made people stand up for themselves and their families and say ‘ enough is enough’ it unleashed a wave of protest around the country, people from all over Ireland rose up to stop the installation of water meters in their communities. The sight of Hundreds of thousands of people on the streets in protest against water charges and austerity is general has the traitors in Leinster house quaking in their boots. Even the jailing of water protestors did not stop the resistance. The battle against water taxes is almost won, a campaign of mass non compliance and non-payment when the bills arrive will kill off Irish water and hopefully the government. With this rising consciousness taking roots among the people, the appetite for an alternative to the neo-liberal austerity agenda North and south is growing. The alternative is the sovereign Republic, a Republic whose socio-economic vision is that of the revolutionary First Dail Eireann, a Republic in which the ownership of Ireland is vested in the people, a republic which puts its people before the interests of international vulture funds and financiers. Despite the fact that the Irish people bailed out the banks these very same banks are starting to evict families from their homes. In collusion with the government and the BAR courts system ( british accredited registry )a legal system which is a legacy of brittish rule and proves on daily basis that the English crown still rules Ireland through her agents in the royal oireachtas in leinster house, a crown construct established by king George V of England in 1922 to subvert democracy and subvert Dial Eireann, Over 100,000 families face the prospect of being thrown out onto the streets. In order to help families in this crisis the National Land League of Ireland has been reformed. The 1916 societies are committed to helping ordinary families stay in their homes and to this end we work with the National Land League. In the 1880’s the Fenian movement provided the backbone for the Land league and Irish Republicans will once again stand against the tyranny of the banks and their agents . As I have outlined the Good Friday agreement will not lead to a united Ireland and Irish republicans have not benefited from it, we still have internment by remand, we still have miscarriages of justice like The Craigavon two, we still have ridiculous situation where a republican can be jailed for making a speech at easter commemorations. The ICC Bank was set up in 1933 by Sean Lemass ( a veteran of the 1916 Rising and Black n tan war )and was modelled on the already established ACC Bank, in an effort to stimulate investment in the Industrial sector. BOS plc operated the Irish mortgage business directly from Edinburgh until 2004 when BOSI took over and moved that business to Dublin. In 2005 BOSI made a bold expansionist move by acquiring the ESB’s ShopElectric chain of retail outlets which almost instantly gave it a 46 branch, high street presence all over Ireland. This acquisition cost BOSI €120 Million without the cost of refitting any location or retraining any staff. This expansion made BOSI the fourth largest Bank operating in Ireland, all in the space of 6 short years, and the 6 most prolific years of the Celtic Tiger era. Bank of Scotland is a reprehensible excuse for a Bank which entered the Irish market with an astonishingly flawed business model, a Bank which singlehandedly altered the face of banking in Ireland by offering 100% mortgages and was also the first bank to offer interest only tracker mortgages. This allowed them to gain a huge market share in both residential and buy-to-let sector. Bank of Scotland will eventually be seen to have been more damaging to Ireland than the infamous Anglo Irish Bank. When the financial crisis hit the country Bank of Scotland’s flawed business model exposed thousands of borrowers leaving them unable to pay back loans on properties which were totally overvalued, Bank of Scotland departed Ireland with its tail between its legs in 2010 leaving a trail of destruction . This departure is cloaked in secrecy by the now infamous Cross Border Merger of Bank of Scotland Ireland and Bank of Scotland PLC, using European legislation which we must again state was never intended for this purpose. We are not allowed to ask questions because the entire process is secret, the accounts are sealed and rubber stamped by courts in Ireland and in Scotland. We know that they provided falsified accounts to obtain the merger , we know that they were trading while insolvent at the time of the merger, which is a criminal offence. We know that they did not file accounts for the year 2010 which again is a criminal offence. We know that Bank of Scotland Plc and its parent Lloyd’s Banking Group have been bailed out by the British taxpayers to the tune of £34 Billion and Bank of Scotland Ireland were allowed to “export” in excess of £30 Billion in losses to the UK to be used as required to write off against future tax liabilities in the UK. So the british tax payer will eventually pick up the tab for bank of Scotland’s venture into Ireland ( not that we care ). But the reality is that they have already been paid in full for all the mortgages issued in Ireland. Firstly by securitising them as mortgage backed securities and selling them onto vulture funds at massive discounts. These banks had a massive negative bearing on the outcome of the Scottish independence referendum, even going as far as instructing employees to vote no. Connolly knew the danger of these commercial institutions and warned us about them. In effect Connolly was right all we did was change the colour of the flag, Scotland must learn from our experience and not make the same mistakes.